Talk about a slap in the face -- after earning $8 MILLION from her infamous Pepsi deal back in 2001, Britney Spears went turncoat by investing in Coca-Cola! We've obtained new docs in Britney's conservatorship case, which detail her investment portfolio, including her overall gains and losses for the year 2012 -- the most intriguing part is what she dumped into Pepsi's arch enemy. 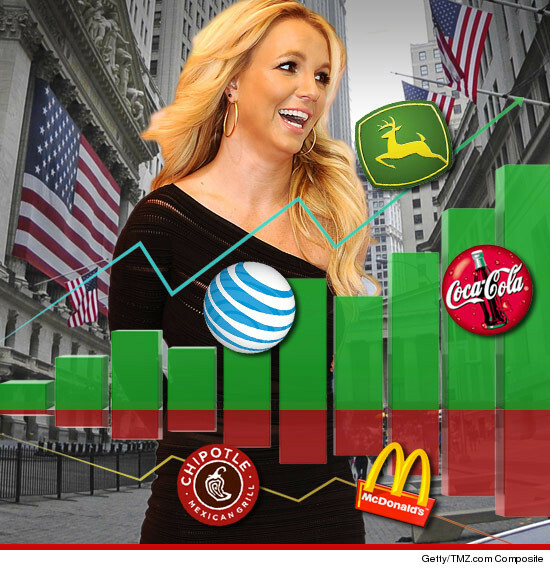 Britney sold 574 shares of Coke for a modest profit of $3,238.55. She held on to 208 shares. As for Pepsi ... it's nowhere to be found in her portfolio. Brit sold a few other random stocks for a profit -- including AT&T and Deere & Co. -- but it wasn't all gravy: she lost $640.13 on McDonald's and $1,277.38 on Chipotle. She eats at both places enough that you'd think the stock would be worth more. Overall, Brit netted $97,883 last year in stock earnings ... not bad, but for her it's chump change (she'll earn more than triple that PER SHOW in Vegas). As for her other holdings: Chevron, Microsoft, Phillip Morris, Heinz, Nestle, Amazon, Facebook, Google, Lululemon, and Visa. Nothing too risky. In all, Brit has just shy of $13 mil of her conservatorship money in the market.